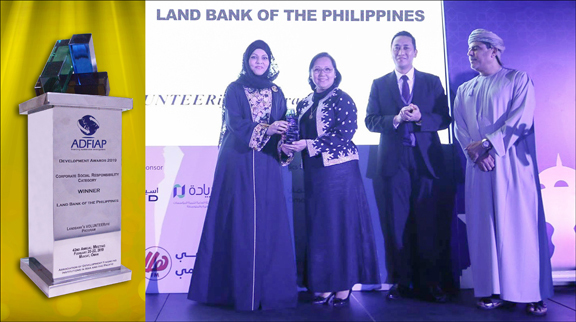 Land Bank of the Philippines’ Volunteerific Program is recognized as an outstanding development project under the corporate social responsibility category of the Association of Development Financing Institutions in Asia and the Pacific Awards 2019. LandBank president and chief executive Cecilia Borromeo (second from left) receives the award from Nahlaa Al-Hammadi (left), director general of the Oman Ministry of Commerce and Industry. With them are ADFIAP chairman Phub Dorji (second from right) and Oman Development Bank chief executive Abdulaziz Mohammed Al-Hinai.